What is your goal when you’re trying to teach someone something? If you’re a minister, what are you trying to accomplish when your sermon is over? If you’re a parent who’s trying to teach your children how to navigate life and serve God, what does that look like in the moment? In both of these examples, the correct answer is a changed heart. And that’s exactly what we’re going to talk about in the fifth article of this communication series. As a teacher/parent/minister, it’s tempting to define teaching as communicating information to a student in the hope that they’ll learn it. But is that really teaching? The Western educational system is built on students taking in information, memorizing it, and reproducing it on a test. But if they were to be asked about that same information a week or two later, many of them wouldn’t be able to discuss it in any detail because they hadn’t actually learned it, only memorized what they had to to do well on the test. Learning is information that is fully absorbed and used in real life. For the believer, learning is a changed heart. Socrates summarized communication in terms of ethos, pathos, and logos. In his mind, ethos was the concept of establishing the teacher’s credibility. He understood the powerful scriptural principle that who you are is more than what you say. Who you are is what you do, who you are as a person. A receiver of information has a much easier time accepting it from a teacher who is credible and living what they teach. Too many ministers, parents, and communicators do not live what they preach. This creates an automatic hurdle for people. The giver becomes a stumbling block for the receiver. The second concept Socrates believed in was pathos. This was defined as compassion, the emotion attached to the communication process. If a teacher really believes in what he’s trying to convey there will be passion and emotion that leads to action. God made us emotional beings and we tend to follow those emotions. So when a parent or teacher teaches with emotion because they live and really believe what they’re saying, it always leads to action that ends in logos. Logos is ethos and pathos wrapped up into action. Interestingly enough, logos is the same word that was chosen in John when it says, “In the beginning was the Word [logos] and the Word [logos] was with God and the Word [logos] was God ... and the Word [logos] became flesh” (John 1:1, 14). God’s message combined with His passion and emotions were wrapped up in an action “Word” that came to change the hearts of men: Yeshua our Messiah. While in New Testament times the Greeks philosophized about the logos and what it was, John came right out and stated exactly what – and Who – it was. Yahweh’s Logos was the fullness of all content, the embodiment of every letter of the Torah, and the entire spectrum of the Creator’s emotional system, all wrapped up in a visible, real-life action hero Who saved us from our sins. Logos completes the concept of what real teaching looks like when done correctly. When we communicate correctly, we’re actually following in the footsteps of the logos. The entire message of the gospel and how it was communicated is the pattern of how we are to teach others. My life verse is 2 Timothy 2:2, “And the things that you have heard from me among many witnesses, commit these to faithful men who will be able to teach others also.” Christ demonstrated this process by having high standards as the communicator, choosing a small group of men to get to know and disciple personally, helping them qualify to teach others. He didn’t just teach them and walk away. He walked it out with them. He WAS their content and credibility. He WAS their passion. And He WAS the instrument that helped them change both themselves and the world. In the end, people are eager to do almost anything for someone they know loves them. It was Yeshua’s compassion that caused His teaching to be so powerful. It was the very thing that motivated His hearers to make changes. It was what was within Christ that caused His teaching to be so effective. 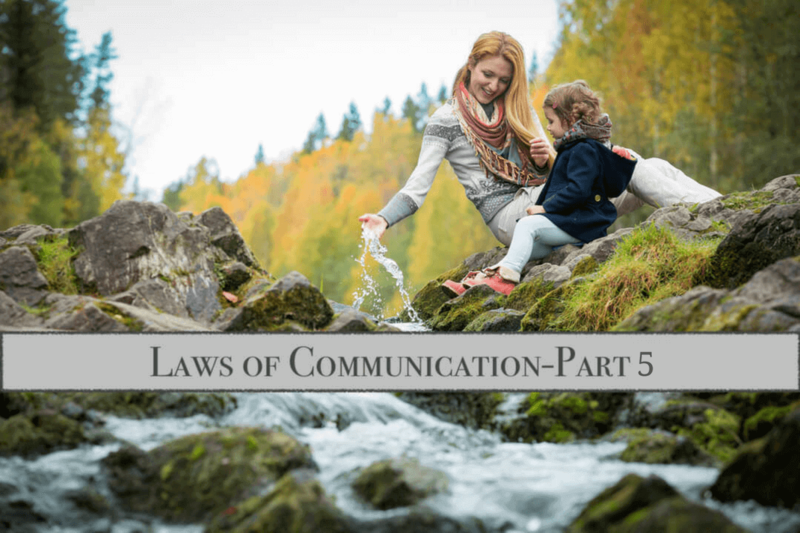 What emanates from within you when you try to communicate something to your children, parishioners, or students? When we communicate to others, we don’t just communicate content, which only leads to perception, we communicate from our whole being, which leads to a changed heart.